TravelVision: We've Come a Long Way, Baby! Before 1983 the world was a vastly different place. There were no personal computers. No cell phones. No Microsoft. No iAnything. That was a mere 29 years ago. Not an actual lifetime ago, but nonetheless it feels like one. Let's look back even further. Although invented, it wasn't until the 1950's that television became the dominant media and everyone had to have one. Television broadcasts became our number one source for news, information, and entertainment. Television had folks so mesmerized that even the commercials captivated audiences. For advertisers it was a golden opportunity. Movies were still on the big screen, hugely popular and cost around $2. There were no ads so talkers were the worst possible interruption. And probably while we were all at the movies, Alaska became the 49th state just making it into that decade. In the 1960's most Americans saw their first color TV and in 1963 audio cassette tapes were invented. Although a far cry from a "1000 Songs in Your Pocket" (2001), music had become personally mobile. MGM's The Wizard of Oz began airing annually on CBS television. Imagine that, waiting for it to come on once a year! And, in 1969 we watched as man landed on the moon. The 1970's were about floppy disks and microprocessors which most of us missed entirely except for the part where the first video game, Pong, was invented. It was also the dawn of Post-it notes, ink-jet printers and liposuction. In hindsight, it was the first practical mobile phone that should be considered the biggest breakthrough of that decade. Although introduced in 1973, a commercial version wasn't available until 1983. The 1980's, although memorable for a lot of bad clothing, also produced VHS, music CD's and MTV. Even though most of us no longer "want my MTV" it ushered in the music video. But, far more important milestones of the 80's are the introductions of Apple and Microsoft. 1984 marked the beginning of the forever imprint of Steve Jobs. After Apple Lisa bombed (1983), Jobs introduced us to the first Macintosh computer (1984) and the world forever changed. To give you more perspective the only computers back then that could do what Apple has since put into brief cases and book bags were super computers that cost 300k. I know because my Ai design class toured a studio in Miami that had one (the only other's in Florida were at Disney). These computers could erase a blemish from a model or a telephone wire from the skyline and we were simply amazed by the technology. But even then few of us thought we'd ever have the privilage of working on such a device and now I'm blogging to you from one. In '85 Microsoft released the first Windows 1.0 operating system and Bill Gates began to leave his indelible impression on our lives. 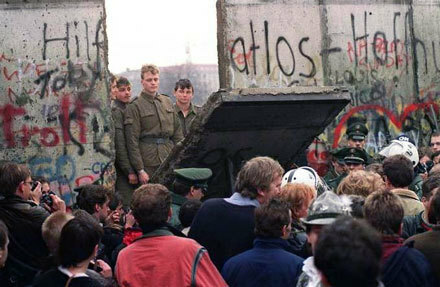 In 1989 the Berlin Wall came down marking the "beginning of the end" for the communist rulers in Eastern Europe. In the 1990's the World Wide Web and Internet protocol (HTTP) and WWW language (HTML) was created by Tim Berners-Lee. Considered the main developer of the World Wide Web, he is the unsung hero of our lives. He not only invented it, he made it free. He is currently the Director of the World Wide Web Consortium, the group that sets technical standards for the Web. His book is entitled, Weaving the Web. The world's at your fingertips! In 2000 the Internet did not have a melt down, despite forecasts, and DVDs were introduced. Over the last few years we've hit so many more milestones. Too many to really name, but note - we're no longer read books, news or magazines on paper. Yes, the world is a far different place. There are certainly some things we wish were carried forward and reminiscing is great fun, but there are many things we've happily left behind us. Looking back, we've adapted incredibly. We like today's technology and its powerful benefits way to much to ever go back, and we look forward to future possibilities. So the time has come to ask yourself why is your marketing still stuck in the past? More importantly, what action are you going to take right now? The world truly is at your fingertips. Its time to take action! If you are in the tourism or hospitality industry move your business forward by signing up for travelvision.com today - Your guests are waiting.